There are many types of hair loss that you may have heard of if you’re searching for a solution to thinning hair. Some of them are referred to by Greek or Latin names. For example, androgenetic alopecia is simply a fancy way of saying, male or female pattern hair loss. That’s the most common type of hair loss, but what about the second most common type? It’s called Telogen Effluvium, which finds its roots in the Latin word effluvium which means “flowing out.” It’s used to describe the shedding of hair. Unlike androgenetic alopecia, which follows a pattern and tends to appear on the same places on the head, Telogen Effluvium is more unpredictable and appears in different places. RHRLI wants you to understand this type of hair loss so you can evaluate your treatment options. In order to understand Telogen Effluvium, it’s important to know about our hair growth cycle. Hair follicles on the scalp do not continuously produce hair, according to the American Hair Loss Association (AHLA). The hair growth stage can take two or more years. At any time during the cycle, approximately 80-90% of hair follicles are growing. That means about 10-20% of follicles are not producing hair. The latter part of this resting phase of the hair growth cycle is called telogen. When Does Telogen Effluvium Occur? According to AHLA, effluvium occurs when the number of hair follicles producing hair drops significantly, giving rise to an increase in telogen stage hair follicles. When that happens, there will be shedding and hair loss. The thinning of hair can spread to different areas of the scalp, often affecting the top. Telogen hairs can be recognized by a small bulb of keratin on their root end. 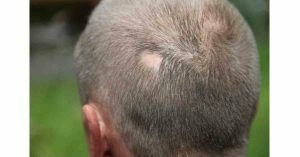 Patients with Telogen Effluvium won’t completely lose all of their hair, according to AHLA. Sometimes the condition develops rapidly as a result of an outside shock. Other times it develops more slowly and persists longer because hair follicles stay in the telogen state longer than usual. Telogen Effluvium can also occur when a person develops shorter hair growth cycles. There are several things that can trigger Telogen Effluvium. As we mentioned, a shock to the system may be a cause and frequently cases involve women developing the condition after they give birth. Physical trauma such as surgery or accidents can also be responsible. According to AHLA, many dermatologists believe chronic stress to be a factor. There is also a debate among dermatologists over whether poor diet can be a cause in North America. A diet deficient in certain nutrients can cause Telogen Effluvium in poorer areas of the world, but most North Americans usually don’t have these deficiencies. Some dermatologists insist that the trend towards eating less red meat can be a trigger. Treatment for Telogen Effluvium can be tricky. If it appears to be caused by a short-term trigger like surgery or childbirth, the best option is to just wait for recovery, according to AHLA. If the cause is easily identifiable like stress or a dietary deficiency, you can work to relieve the problem. But if the specific cause can’t be found and the condition is chronic, it could be time to think about a long-term solution. If you’re looking for a permanent solution to hair loss or thinning hair, RHRLI can help. We are the only hair loss treatment center on Long Island that uses the ARTAS® Robotic Hair Transplant System. Other options like painful surgery or transplant procedures from doctors using handheld devices aren’t as accurate. The ARTAS® System will leave you with a full and healthy head of hair. To get started, contact us today. Previous Post: « Are There Any Complications from Hair Restoration Surgery?